If this card is Normal or Special Summoned: You can Special Summon 1 “Mayakashi” monster from your Deck, except "Hajun, the Winged Mayakashi”. You can only use this effect of “Hajun, the Winged Mayakashi” once per turn. 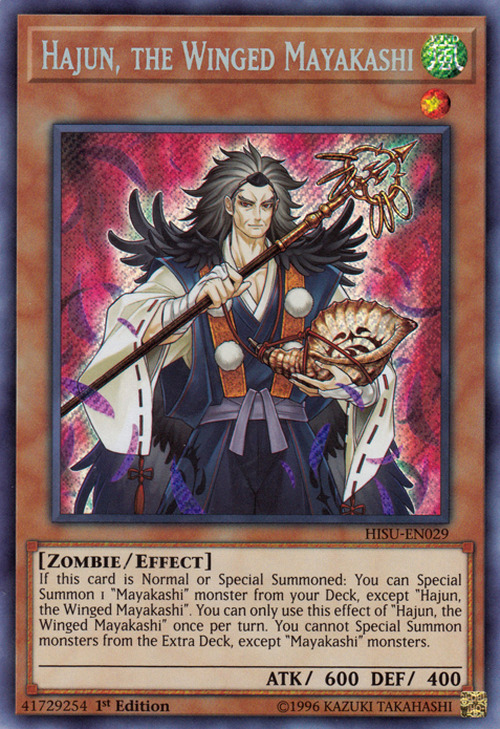 You cannot Special Summon monsters from the Extra Deck, except “Mayakashi” monsters. Hajun, or papiyas, is a type of evil spirit in Buddhist mythology. This monster is holding a khakkhara. Tengu, the Winged Mayakashi is the Synchro counterpart of this card. This card's general design is similar to that of Shiranui Solitaire, also, their color schemes are reversed, hinting to a connection between both monsters in terms of lore.